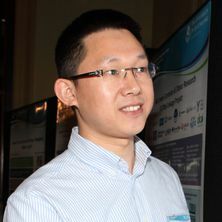 Guangming is a research fellow funded by Queensland Government and Australian Research Council. He has broad research interests in wastewater infrastructure management, environmental health and environmental materials. He is now an honorary research fellow at Advanced Water Management Centre. Understand and modelling of the transport and transformation of illicit drugs, pharmaceutical products in the sewer systems. Develop novel concrete materials for resilient and sustainable wastewater infrastructure. Develop network wide control for environment-friendly and cost-saving chemical dosing. Understand the physicochemical and biological processes of concrete corrosion in sewer environment. Yuan, Z., Jiang, G., Gutierrez, O. Control of Bacterial Activity, Such as in Sewers and Wastewater Treatment Systems (International PCT patent), Patent No. in China (ZL201180026611.8) and Australia (2011245067). 2016 USP Technologies is currently providing the Cloevis Biofilm Removal Service at 6 sites in the US with the potential for 20 sites by the end of 2016. The licence agreement is to be signed by mid-2016. 2013-2014, A full-scale trial was accomplished for odour and corrosion control in the sewers of Unity Water. 2012, Four full-scale field trials in the United States had been on track with commercialisation partner, US Peroxide, to promote and demonstrate the Cloevis technology in North America. 2012, A full-scale field trial was successfully completed at the UC9 sewage pumping station, Gold Coast Water. 2012, A commercialising partnership was established between a US company, US Peroxide, and Cloevis for its market development and field trials. The value of Cloevis was estimated to be around $ 2.5 million at the time. 2010, To commercialise my patented technology, Cloevis Pty Ltd, as a startup company, was established between AWMC and Uniquest, the commercialisation arm of UQ. Cloevis works on the commercialization together with water industry partners from the United States (US Peroxide) and Australia (Unity Water and Gold Coast Water). Gutierrez, Oriol, Jiang, Guangming, Sharma, Keshab and Yuan, Zhiguo (2016). Biofilm development in sewer networks. In Anna M. Romaní, Helena Guasch and M. Dolors Balaguer (Ed. ), Aquatic biofilms: ecology, water quality and wastewater treatment (pp. 145-164) Girona, Spain: Caister Academic Press. Wang, Chengduan, Chen, Wenmei, Li, Jianming and Jiang, Guangming (2002) Flow field test on the tangential section of polypropylene tubular membrane module annular gap in rotating linear tangential flow. Huanjing Kexue/Environmental Science, 23 4: . Jiang, Guangming, Bond, Philip, Keller, Jurg and Yuan, Zhiguo (2017). An overview of 10 years of research in understanding and preventing concrete corrosion in sewers. In: European Corrosion Congress (EUROCORR 2017) and 20th International Corrosion Congress and Process Safety Congress 2017: Corrosion Control for Safer Living. EUROCORR 2017, Prague, Czech Republic, (). 3-7 September 2017 . Jiang, Guangming, Chiu, Tsz Ho, Zhou, Mi, Sun, Xiaoyan, Bond, Philips, Yuan, Zhiguo and Keller, Jurg (2015). Concrete sewer corrosion due to wastewater inoculation. In: European Corrosion Congress, EUROCORR 2015. European Corrosion Congress, EUROCORR 2015, Graz, , (403-409). September 6, 2015-September 10, 2015. Jiang, Guangming, Yuan, Zhiguo, Bond, Philips and Keller, Jurg (2015). Predicting the corrosion initiation time of fresh concrete sewers by artificial neural network. In: European Corrosion Congress, EUROCORR 2015. European Corrosion Congress, EUROCORR 2015, Graz,, (). September 6, 2015-September 10, 2015. Sun, Xiaoyan, Jiang, Guangming, Bond, Philip and Keller, Jurg (2014). Understanding H2S uptake dynamics by corroding sewer concrete with fluctuating H2S concentrations. In: IWA World Water Congress and Exhibition 2014, Lisbon, Portugal, (). 21 - 26 September 2014. Wang, Q., Ye, L., Jiang, G., Jensen, P., Batstone, D. and Yuan, Z. (2013). A novel free nitrous acid (FNA)-based technology for enhancing methane production from waste activated sludge. In: LET 2013: 10th IWA Leading Edge Conference on Water and Waste Water Technologies 2013, Bordeaux, France, (). 2-6 June, 2013. Jiang, G., Keating, A., Corrie, S., O'Halloran, K., Nguyen, L. and Yuan, Z. (2013). Australia field trials of H2S odour control in a rising main sewer by dosing free nitrous acid. In: 5th IWA Conference on Odors and Air Emissions jointly held with 10th Conference on Biofiltration for Air Pollution Control, San Francisco, CA, USA., (). 4-7 March, 2013. Jiang, Guangming, Keating, Anthony, Corrie, Shaun, Ohalloran, Kelly, Nguyen, Lam and Yuan, Zhiguo (2013). Development and field trials of a novel technology for sulfide and methane control in sewers. In: Ozwater’13, Perth, WA, Australia, (1-4). 7-9 May, 2013. Jiang, Guangming, Bond, Philip and Keller, Jurg (2013). Long term investigation of concrete corrosion processes in sewers. In: Ozwater'13, Perth, WA, Australia, (1-5). 7-9 May, 2013. Yuan, Zhiguo, Jiang, Guangming, Keating, Tony, Corrie, Shaun, O'Halloran, Kelly and Nguyen, Lam (2013). Sulfide control in sewers by intermittently dosing acidified nitrite: from scientific discovery to application. In: SPN7 2013: 7th International Conference on Sewer Processes and Networks, Sheffield, UK, (). 28-30 August, 2013. Wang, Qilin, Ye, Liu, Jiang, Guangming and Yuan, Zhiguo (2012). A cost-effective Free Nitrous Acid (FNA)-based technology for achieving sludge reduction in wastewater systems. In: 2nd Water Research Conference, Singapore, Singapore, (). 20-23 January 2013. Zhou, Xu, Chen, Chuan, Wang, Aijie, Jiang, Guangming, Liu, Lihong, Tan, Wenbo, Xu, Xijun, Lee, Duu-Jung and Ren, Nanqi (2012). Biosorption of Cu(II) by powdered anaerobic granular sludge from aqueous medium. In: IWA Nutrient Removal and Recovery 2012 (IWA NRR 2012), Harbin, China, (). 23-25 September 2012. Jiang, Guangming, Gutierrez, Oriol and Yuan, Zhiguo (2011). Control of anaerobic sewer biofilms using the biocidal effect of free nitrous acid. In: IWA Biofilm Conference 2011:Processes in Biofilms, Shanghai, China, (). 27-30 October 2011. Jiang, Guangming, Gutierrez, Oriol and Yuan, Zhiguo (2011). The biocidal effect of free nitrous acid on microorganisms in anaerobic wastewater biofilms. In: 8th IWA Leading-Edge Conference on Water and Wastewater Technologies, Amsterdam, The Netherlands, (). 6-10 June 2011. Jiang,Guangming, Gutierrez, Oriol, Sharma, Keshab R., Keller, Jurg and Yuan, Zhiguo (2010). Free nitrous acid controls sulfide and methane production in rising main sewers. In: Proceedings of the 6th International Conference on Sewer Processes and Networks (SNP6). 6th International Conference on Sewer Processes and Networks (SNP6), Gold Coast , Qld., Australia, (). 7-10 November 2010. Guangming Jiang (2010). Control of Sulfide and Methane Production in Sewers Using Nitrate and Nitrite PhD Thesis, School of Chemical Engineering, The University of Queensland. Yuan, Zhiguo, Jiang, Guangming and Gutierrez, Oriol (2010). Control of bacterial activity, such as in sewers and wastewater treatment systems. 2010901790.